Well, it’s official. Summer’s over, fall’s here, kids have been back to school for a few weeks and the campaign season is moving headlong toward Election Day. That means there’s a lot going on. Usually, these policy updates focus on one or two key items but this one will touch on several important points that are all happening at once. Developing a 2017 Legislative Agenda: OSEIA members from all over the state contributed a couple dozen policy ideas to strengthen and grow solar over the next few years. Members have also been ranking those ideas over the past several weeks. Have you had a chance to weigh in? If not, stop right now and go tell us what you think of the various proposals. There is a nice mix of “immediate” issues along with more long-term items. The chance to offer your opinion is running out soon. Oregon SolarPAC: We’ve started meeting with candidates running for the state legislature, telling them about issues that are important to the solar industry and offering some financial support for their campaigns. 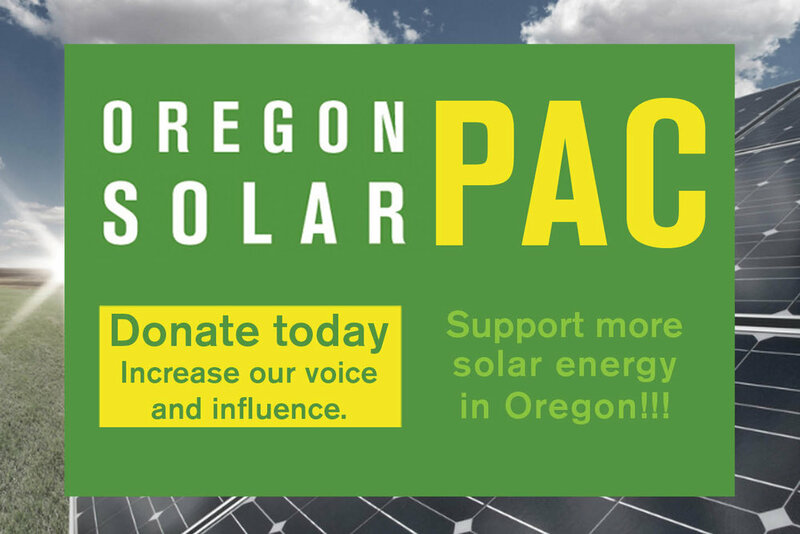 Oregon SolarPAC has gotten donations from solar professionals all around the state. Contributors are getting the invites to be part of the meetings with candidates. Our success with Oregon SolarPAC will directly impact our agenda in 2017. So, if you haven’t given yet, take a moment now. Remember, giving $50 is covered by the Oregon Political Tax Credit. That means supporting solar doesn’t cost you anything! So give today because time is running out. Once you give a donation, let Max Muller know you want the current list of meetings with candidates and join in! Oregon Solar Business Plan: OSEIA is undertaking a project to create the Oregon Solar Business Plan (OSBP). Working in conjunction with the Green Energy Institute (GEI) at Lewis and Clark Law School, OSEIA will research and analyze policies and market opportunities for solar energy in Oregon. The project will perform research and draft analyses and provide recommendations for advancing solar energy development in Oregon. This research and analysis will outline the current status of solar energy in Oregon, identify Oregon’s potential for deploying solar energy resources over five and ten-year timeframes, and identify and recommend a suite of policies and market-based mechanisms that will enable Oregon to achieve its full potential for increasing solar energy capacity over the next decade. If you want to join other solar businesses in contributing resources to develop the Oregon Solar Business Plan, please contact Craig Ernst. PUC Activities: The Oregon Public Utility Commission has several open dockets directly related to solar. OSEIA members have heard a lot about the draft solar report. Our involvement is making a difference and there is now a good chance that the final report that goes to the legislature will be a much more reasonable document. Community solar rulemaking finally got underway at the end of August and must be concluded by July 1, 2017. Lastly, the resource value of solar (RVOS) docket is about to enter a critical phase where we determine the methodology to identify the value that solar delivers to the utility system. This will be a critical proceeding that will affect factors from community solar to net metering. Follow the progress of the dockets and all of OSEIA’s policy work through the OSEIA Policy Committee. Better yet, if you are an OSEIA member, consider joining the committee. Those are the highlights of the policy update for this month. Please stay in touch and thanks for your support!